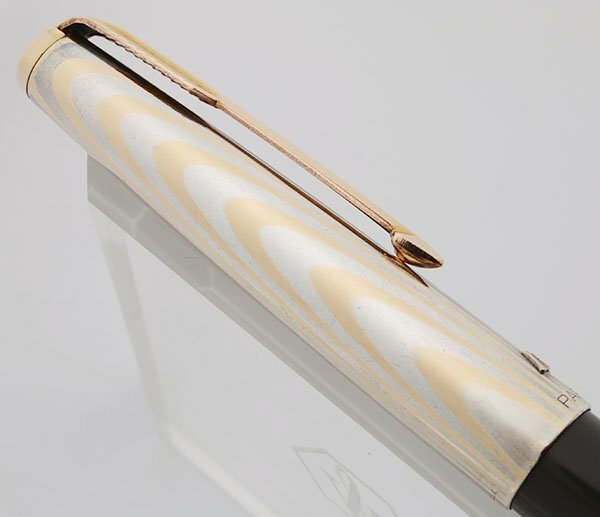 Grey Parker 61 with "Heritage" with a rainbow cap made of alternating swirls of gold fill and silver. Medium 14k nib. Excellent + condition. First edition cap emblem. 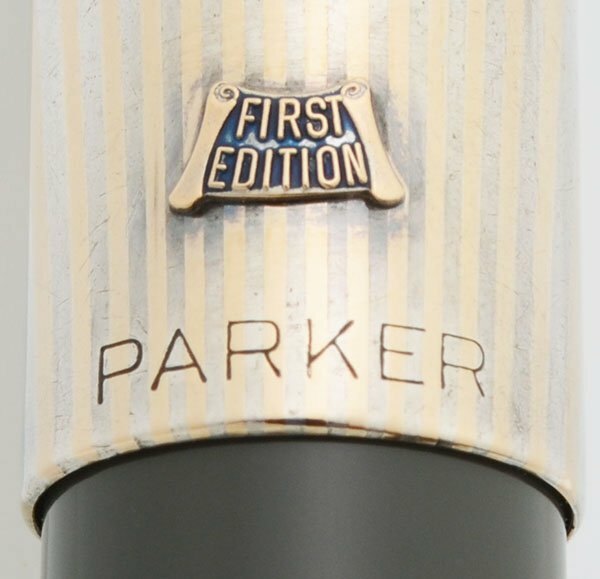 Manufacturer and Year Parker, USA -- 1956, it has the first edition emblem on the cap. Filling System Capillary filling system which is unique to this model. See further details below. Color Grey body with the Heritage "rainbow" cap made of alternating ripples of silver and gold fill. The hallmark on the cap says, "1/10 12K GF." Each end of the pen has a pearlescent jewel inset. Nib Medium 14k nib is smooth, with good tipping material. It is a little broad but we decided to call it a medium nib. Condition Excellent + condition. The pen has light scratching only. There are no cracks, chips, dents, or personalization. The gold trim piece at the end of the barrel has some scratching. The gold arrow inset on the section has light scratches only and is well-secured. The cap glows and has only light scratching. The clip is beautiful. Imprints are all clear. Small area of missing teflon on the capillary filling system, as can be seen in the photo below. A word or two about the Parker 61 Capillary Filling System. If you are not familiar with this unique design, you should read this. 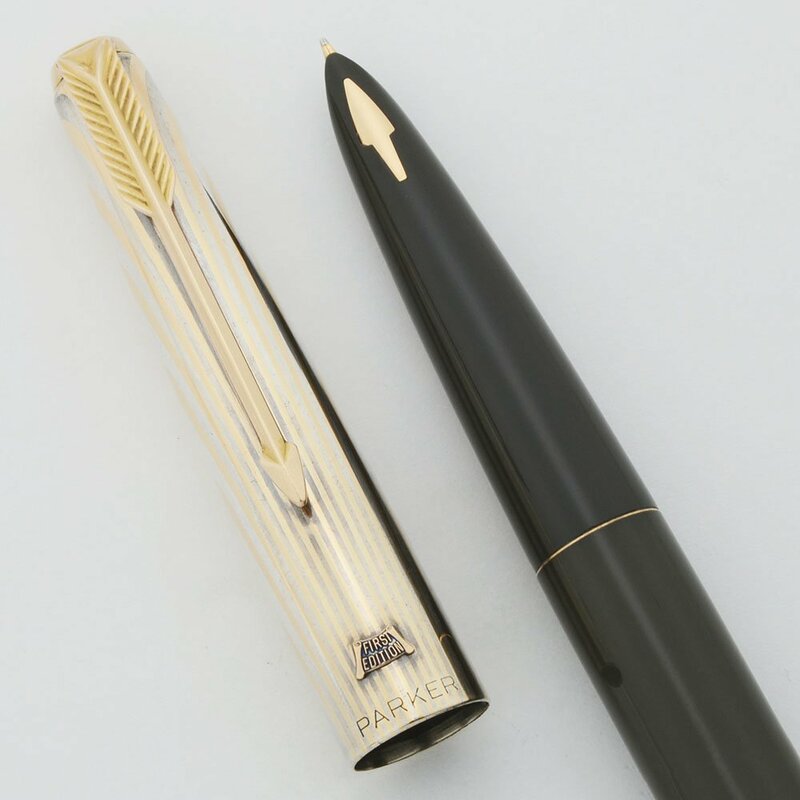 Here is how you fill a Parker 61, and an insight into how the pen actually works. Unscrew the barrel and stick the back end of the pen (aka the capillary cell) into a bottle of ink. Wait a few minutes (probably more like a half hour when you first start one of these older used ones), and let the ink wick up into the capillary cell. The cell contains a sheet of perforated plastic that has been given a 3-D pattern resembling tire tread, and rolled up. The perforations allow ink to seep between the rolled-up layers, and the tread pattern maintains space between the layers. In the middle of this tube, which runs the entire length of the capillary cell, is the feed. To keep things clean, the capillary cell has on a coating of teflon on the outside that is intended to shed ink as the user withdraws the pen from the ink bottle, leaving very little ink to be wiped off. 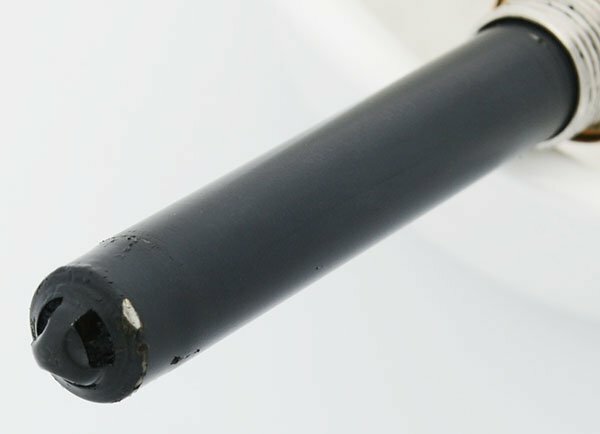 The end of the barrel contains a spring-loaded thingey which covers the open end of the capillary tube, but still allows it to vent.